San Diego has no shortage of excellent beach options. There is a beach for every mood, whether you’re looking for a quieter spot to spend the afternoon, or a lively area where you can people-watch to your heart’s content. 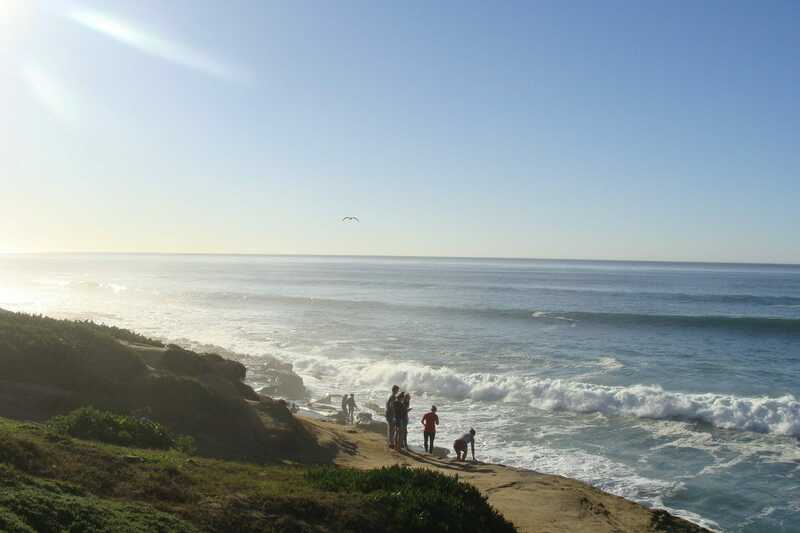 This post doesn’t include the beaches in North County (of which there are many stunners), but for more information on those check them out in this post: 20 Day Trips From San Diego. Okay, without further ado here are seven of the best beaches in San Diego that are worth packing your beach bag for. For a beach day with a side of San Diego history, this city has one of the most scenic in the area with its gold-flecked sand (a result of the mineral mica), and the iconic Hotel Del Coronado in the background. Spend the day on the immaculate 1.5 mile beach, either on your own towel or if you want to splurge (it’s a great way to celebrate a special day) rent a day lounger from the hotel-even if you’re not a guest. If you’re there at low tide, check out the tide pools teeming with marine life right in front of the hotel. Travel tip: there are public restrooms near the Central Beach lifeguard tower, but if you’re close to the southern end of the beach the hotel has better bathrooms. Depending who you ask this central beach has many different sections, but just for the sake of keeping it easy, we can divide it into two main parts: Ocean Beach Pier, and Dog Beach. Ocean Beach Pier has prime surfing area that is right by the pier and a bit north there’s the main beach. If you have a furry friend in-tow, the Dog Beach is the place to go to let them frolic in the surf. Even if you don’t have a pup of your own, watch other’s people dogs having the time of their lives is always a good excuse to venture over to this side of the beach. Head to nearby Newport Avenue, the OB’s main drag to explore this neighborhood that boasts a small-town feel. This beach is a bit more laid-back than Mission Beach and Pacific Beach, its more party-prone neighbors to the north. For prime people-watching, this lively one-mile stretch of beach is filled with surfers, sunbathers, tourists, and volleyball players. After you get your fill of the actual beach, wander down Ocean Front Walk that is filled with shops, cafes and rental shops. Stop at Belmont Park, an iconic amusement park and boardwalk known for its carnival games, souvenir shops, restaurants, and rides like a wooden roller coaster that was built almost a century ago. Rent a bike from one of the local rental shops, since it’s a perfect way to cover a lot of ground and also get your daily workout in. There’s plenty of parking near Belmont Park. One of the liveliest beaches in San Diego, that is connected to Mission Beach in the south. There is plenty of action from surfers searching for a perfect wave to sunbathers taking advantage of another sunny Southern California day. This is not the spot you want to go to if you’re looking for a quiet beach day. Find a spot on the historic Crystal Pier, where you can take in the coastal views, and watch surfers do their thing. Wander around the boardwalk, past gift shops, bike and scooter rentals, and ice cream stores. North Pacific Beach which stretches from Tourmaline to Crystal Pier is a bit quieter and ideal for families since it has lifeguard-supervised swimming areas as well as nearby restrooms and showers. This area is known for being one of the city’s most picturesque, with a beautiful rugged coastline and stunning beaches. This beach is over a mile, and boasts different sections like the northern end with Scripps Pier and the southern end with the La Jolla Cave, which is popular with kayakers. Scuba diving is popular here as well, with the La Jolla Underwater Park in the southern part of the beach. There are permanent lifeguard stations that are located on the beach, that are helpful in letting you know about things like strong undercurrents. The adjacent grassy park is a great spot to watch the sun set with an impromptu picnic. Public parking is free, but get here early since the lot tends to fill up. Located just above La Jolla, this beach is a bit more rugged, but equally as beautiful. To get to the beach you need to make your way down sandstone cliffs. The adjacent Torrey Pines State Reserve is a state park that boasts 2,000 acres of natural coastline with plenty of migrating shorebirds birds to watch. Go early if you want to have the beach to yourself (along with a few surfers). There is limited free parking on the side of the road, otherwise parking in the lot will coast you a hefty $12-$25 depending on the day and the demand. This southernmost city in California before you reach the U.S./Mexico border has a beach that is worth heading down south for. The Imperial Beach Pier is a great place to take a stroll and watch the fishermen with their daily catch. On the beach itself there are cafes and stores, as well as the Tin Fish, a casual seafood restaurant located on the pier itself. If you’re around on a Friday from 2pm-7pm (2pm-6pm in winter), make sure to check out the local farmers market in the Pier Plaza. What are the best beaches in San Diego in your opinion?